"drupal-planet" would be converted to the taxonomy term ID which then would filter the view results accordingly. I would like it to also work with the term name like D7 did. Is the functionality missing, or do I need to configure the view differently? The Term name converted to Term ID filter looks to be missing for D8 Views. One site-builder workaround, is to add a Relationship, Taxonomy terms on node then to add a Taxonomy Term: Name filter to Contextual Filters using the aforementioned relationship. Checking the Specify validation criteria checkbox, set your Validator to Taxonomy term name & check the appropriate Taxonomy to filter on. Just for the sake of completion, at the time of writing the question I've managed to get around this issue by converting the taxonomy term name from the URL to a term ID in views_hook_pre_view() and then using it as input for the contextual filter which accepts taxonomy IDs. I don't know if you still have this problem but I was able to create a relationship for "Taxonomy terms on node" using the desired taxonomy vocabulary and then create a contextual filter using that relationship for "Taxonomy term: Name" which allows you to validate based on name rather than TID. 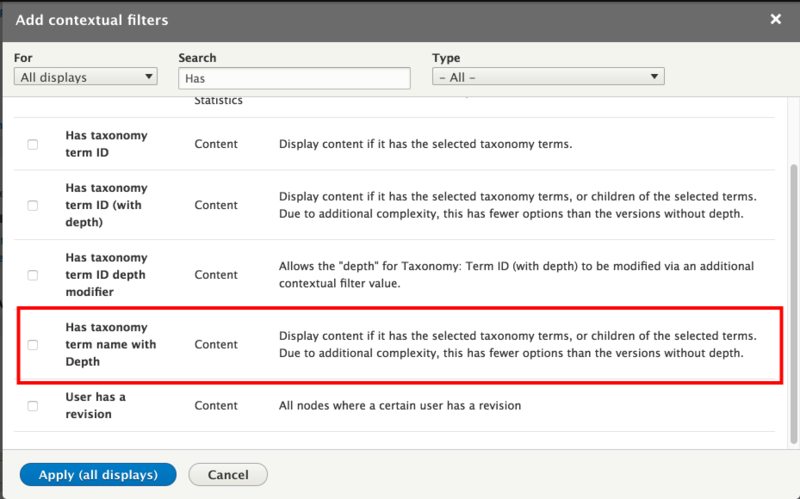 @kiethm Has provided the correct way to approach this - Under the Contextual Filters you need to select 'Name' and not 'Taxonomy Term ID' then set your validation criteria to use 'Taxonomy Term Name'. On the next screen choose the 'tags' vocabulary and require the relationship. Under 'When Filter is NOT available', choose 'Provide default value', 'Raw value from URL'. Select any other options appropriate to your needs. Under 'When Filter IS available or a default value is provided' choose 'Specify Validation Criteria' and select 'Taxonomy Term Name' for the validator. Choose the 'tags' vocabulary and then click apply. I'm using Drupal 8 and Zircon. I'm brand new so I may use the wrong terms. I wanted to make contextual image links in "Panel first col 1" based on the Category of the page that someone is on. What I did was go to Structure > Views > Carousel (the view that has the pictures in that block region) > Advanced > Add by Contextual Filters > Has taxonomy term ID > select in Provide default value: Taxonomy term ID from URL (which made no sense to me but whatever) > then I checked all three boxes: Load default filter from term page, Load default filter from node page, that's good for related taxonomy blocks, Limit terms by vocabulary. Then for Vocabularies I checked Categories. PHEW! Finally! Thanks to you all on here for pointing me in the right direction! I could not explain why it works, totally, but whatever, it does and I will keep being employed. 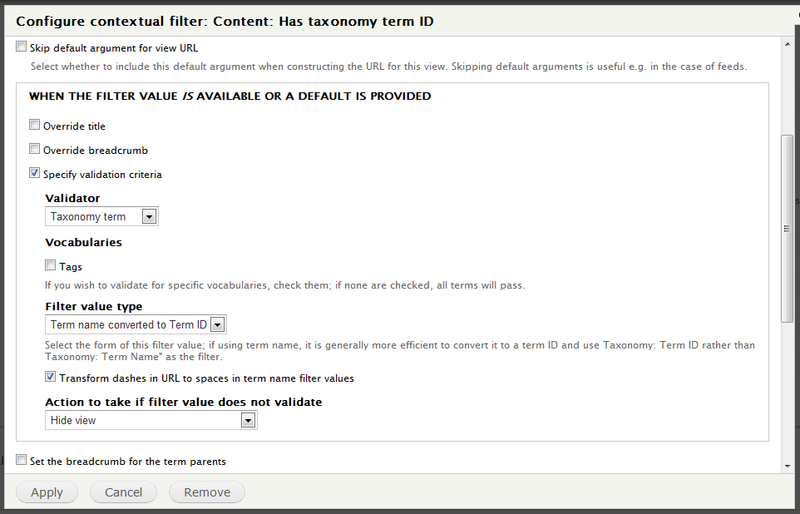 It re-adds the 'Convert term name into ID' argument validator for taxonomy terms used in 'contextual filters' in Views. See the project page for more info and instructions. Not the answer you're looking for? Browse other questions tagged views taxonomy-terms 8 or ask your own question. Filter User in Views based on taxonomy contextual filter?